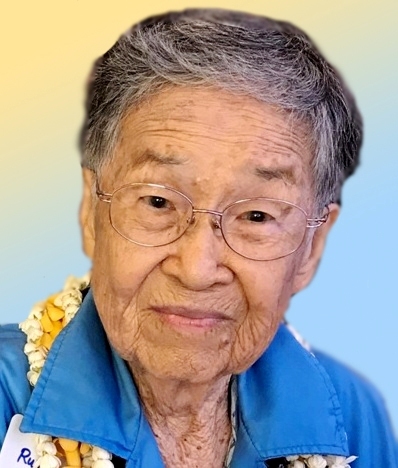 95, formerly of Kahuku, a retired cafeteria worker from Hau'ula School and Laie Elementary school, passed away on January 25, in Aiea. She was born in Honolulu. She is survived by daughter Amy, sons Andy (Frances), Wallace, and Neal (Merle). Brother, Komaki Fukuyama, sisters Sachiko Nitta, and Marilyn Adachi. Grandchildren, Aron (Melissa), Ason (Fallyn Kapoi), Christine (Oliver Coulter), Jennifer, Colette (Jeffery Lee), Brent (Appi), and six great-grandchildren. Visitation 4:30pm, service 5:30 pm Tuesday, February 12, at Borthwick Mauka Chapel. Casual attire. No flowers.